We over-50s came of age just at the time when air travel was becoming dominant. We saw the decline and fall of the dominance of rail and steamship travel. I can remember when I was a kid, we went to bon voyage parties aboard the cruise ships my grandparents were taking to Italy. I can remember my school friends taking the train to Miami. But by the end of the 1960s, it was all air travel. Back in those pre-terrorism-mentality days, people who were meeting a flight could go right to the gate. Needless to say, there was no searching of passengers, and their carry-ons, although simple metal detectors were brought in after people began hijacking planes to Cuba. Anyway, people our age grew up with air travel. It wasn’t special like it was for our parents. It was just transportation, faster than the train or steamship. And that speed meant that getting there quickly took a priority over enjoying the sights along the way. While trains had big, glass-enclosed touring cars so that you could see the countryside, airliners climbed to 40,000 feet, and showed you the tops of clouds. But air travel doesn’t have to be this get-there-quick-with-the-shades-drawn-while-we-watch-a-movie-and-eat experience. It’s possible for air travel to be just as leisurely, and scenic, as train travel – you just have to know someone who has their own plane. 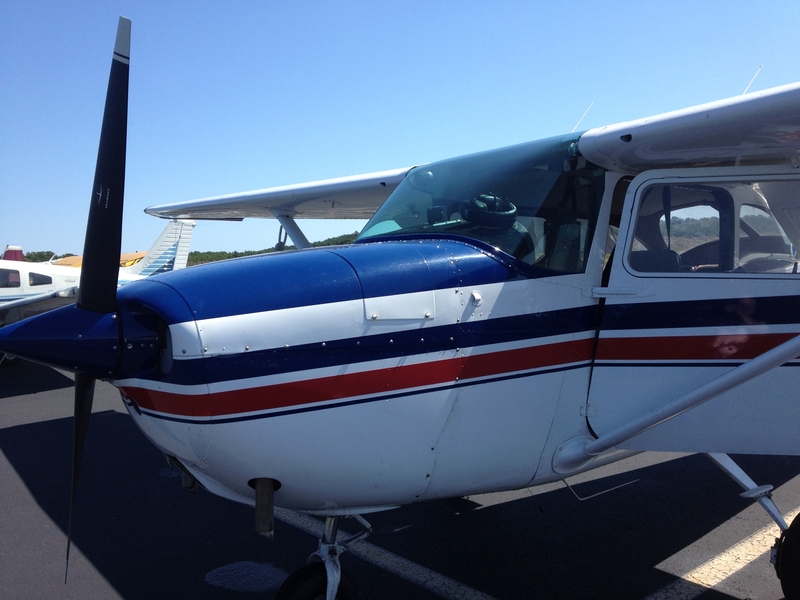 Fortunately, I have a friend my age who learned how to fly his own plane after he reached the right side of 50. Brian lives in upstate New York, and flies his plane all over the East Coast. Sometimes he flies down to a small airport in New Jersey, and visits with me and my wife (we were all college classmates together). And sometimes we drive to where he is and he takes us up for a scenic view. Recently, we drove to Cape Cod to meet Brian and his 92-year-old mom. 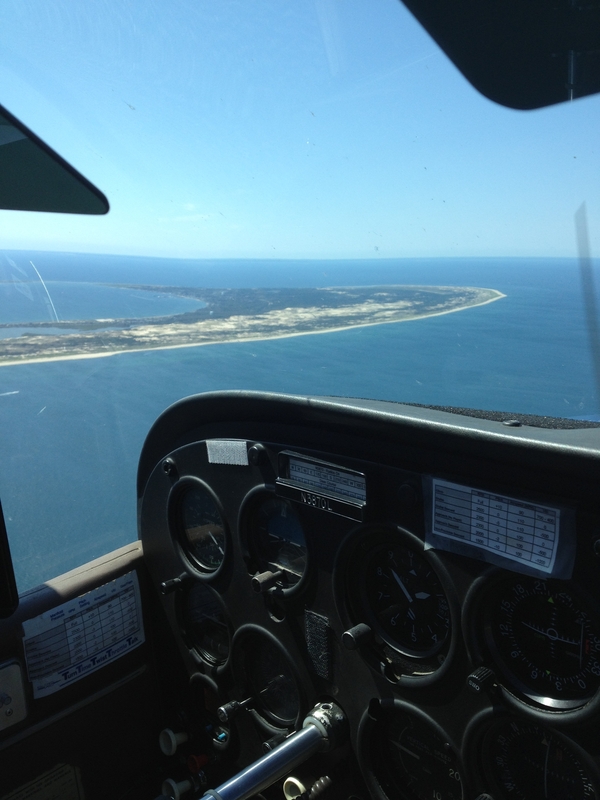 Brian had his plane at the Provincetown Airport, and he took my wife and me up for a leisurely tour of the end of Cape Cod. We were high enough to get the Google Earth perspective of the Cape, but close enough to the ground to see the details of houses and shoreline below us. It was marvelous. While we were out flying, there were some hot air balloons in the distance and it occurred to me that that is another way to get a leisurely air view. It’s travel where the trip is all the fun, and you get there when you get there. That type of travel is more and more appealing to me all the time. My wife and I will be taking a Mediterranean cruise next month, and I look forward to just sitting on my balcony and watching the world go by. I don’t know whether that means I’m getting old, or just that I have come to appreciate taking the time to stop and smell the roses. I like to think it’s the latter.